Since Matt is doing most of the cooking right now, he is also coming up with most of the weekly menu. This week he said he wanted to make meatloaf (I think it's mainly because he wanted meatloaf sandwiches later in the week). 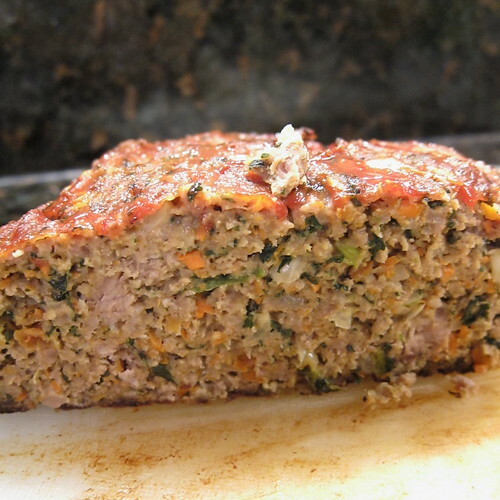 He said his goal with this meatloaf was to not only make it tasty, but also fill it with a bunch of vegetables. 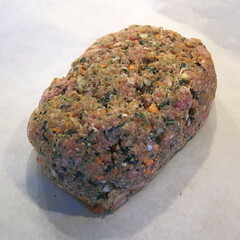 So he added carrots, kale, sun-dried tomatoes and onion to the meat mixture. 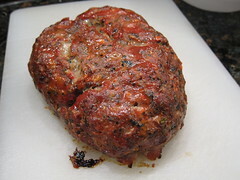 Add some chipotle and cayenne and what we ended up was one heck of a flavorful, moist meatloaf. Maybe the best one I've ever had. It was hard not to go back for a second slice, but I then there wouldn't be any left for sandwiches, would there? If you have a hard time getting folks in your family to eat dark greens like kale, try this meatloaf, it's a great way to sneak it in. Make sure to use a mix of ground meats in this, it really adds to the flavor. In a large bowl mix the seasonings together. Put the garlic, carrots, tomatoes, kale and onion in a food processor. Process until finely minced. Add the vegetables to the spice mixture. Stir in the bread crumbs and eggs. 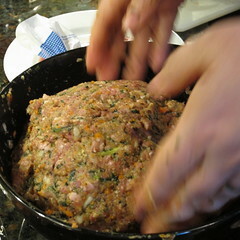 Add the meat and use your hands to gently mix everything together. We only wanted to cook half of the mixture and it was too small for our loaf pan, so we shaped it free form on a parchment covered baking sheet (We froze the other half of the mixture in a loaf shape to cook up another time.) You can use a loaf pan if you wish. Bake for about 60 minutes or until thermometer inserted into the center registers 155 F. After 20 minutes brush the loaf with a thin layer of ketchup. Let rest for 5 minutes before cutting. The full recipes makes about 8 servings. Hey, I have never frozen the raw meat. I will try that. And any time I can hide/blend a vegetable anywhere, I will. Thanks for the tip. I have divided meat loaf, and put it into mini loaf pans. That has helped us with portion control. Making meatloaf because you want meatloaf sandwiches sounds perfectly reasonable to me! This looks much less stodgy than most meatloaves I have had. Bet the vegetables keep it moist as well. 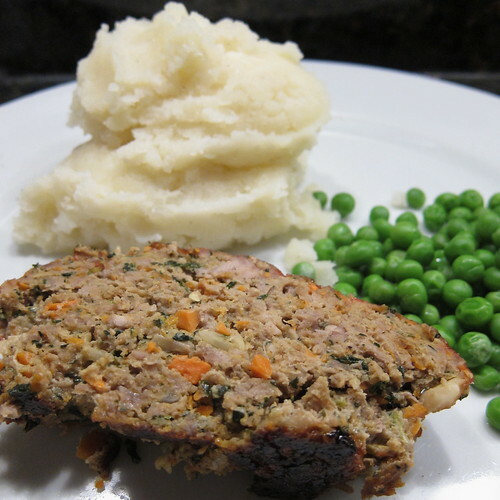 Great meat loaf recipe! I am a meatloaf lover. It's true. I love the stuff. Love it in leftovers as sammies. So good. It's all about the sandwiches baby! Way to go Matt! I'm attending a meatloaf cook off this month and I'm looking for ideas. This is a great option. Wow, this looks like great meatloaf. It is the best comfort food. That does look like one good meatloaf! Thank you SO much for the recipe and the idea. I made it this weekend myself and have been enjoying every last sandwich since. So, so delicious! Next time I am adding tomato sauce to mine because it was a little dry (I skipped one of the eggs). But chopping all the veggies up in a food processor was a brilliant idea! Thanks, I linked this from my blog where I posted about making this.